Kevinhydea brevistipitata gen. et sp. nov., and Helicoma hydei sp. nov., collected on decaying wood in terrestrial and freshwater habitats, respectively, are described and illustrated. Kevinhydea brevistipitata, the type species for a novel monotypic genus (Kevinhydea), is characterized by its macronematous, short conidiophores, and dictyosporous conidia. Helicoma hydei morphologically resembles H. guttulatum, but they are phylogenetically distinct species. Phylogenetic analyses of combined LSU, ITS, and TEF1α sequence data of 63 taxa were carried out to infer the phylogenetic affinity of new taxa within the family Tubeufiaceae. Additionally, phylogenetic analyses for the genus Helicoma, comprising 33 taxa, were performed separately to justify the new species H. hydei. Kevinhydea brevistipitata and Helicoma hydei are phylogenetically distinct from other species in Tubeufiaceae. A morphological comparison of dictyosporous hyphomycete genera in Tubeufiaceae is provided. The Faculty of Agriculture, Natural Resources and Environment, Naresuan University is acknowledged for providing Ph.D. research scholarship to Ning-Guo Liu. 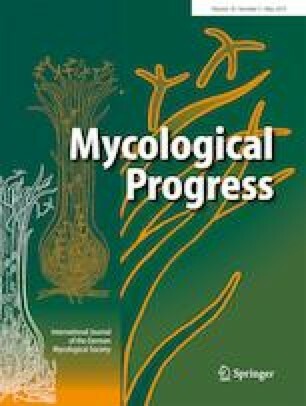 We are grateful to Dr. Shaun Pennycook for providing the advice on fungal nomenclature. National Natural Science Foundation of China (NSFC 31600032) and Science and Technology Foundation of Guizhou Province (LH 7061). Rambaut A (2006) FigTree. Tree figure drawing tool version 1.3.1, Institute of Evolutionary Biology, University of Edinburgh. <http://tree.bio.ed.ac.uk/software/figtree/>.